FORMER Bahati member of parliament Harry Kalaba says he is not going to engage in cheap politics of untruths and character assassination President Lungu has unleashed against him. In a statement, Kalaba said a country full of natural resources, full of intelligent and hardworking people with great potential to turn it into a higher middle income and developed country, regrettably had a leadership which was not only corrupt but had no ideas of how to manage its affairs. He wished that top political leadership could heed to the cries of the people of Zambia; the workers, students, the unemployed majority and the church and to start reflecting while working to the dictates of the constitution. Kalaba said the top leadership need to work towards getting the economy from the “Intensive Care Unit” and render itself to the advice of civil servant technocrats. “We have a bankrupt treasury, yet President Lungu refuses to accept the inevitable reality and further refuses to conform his lifestyle to the budget. They have instituted austerity measures but they themselves are exempt from these measures. Leadership is humility, leadership is sacrifice and dying for your people. President Lungu does not have a heart for that. He believes you and I should sacrifice while he continues basking in a high-level life beyond what any president in the region including the Western countries engage in,” Kalaba said. He said with high unemployment at 42%, should be considered a national crisis while those in formal employment were not being paid on time. “Government is in clear contravention of its own laws, the Employment Act Chapter 268 of the Laws of Zambia, Article 48 number 1 and 2, which state that the wages of an employee shall be due in the case of a contract of service from month to month, on the last day of each month, and in the case of an employee employed on a task or piece work, should be paid on the completion of such task or work. If there is a delay in payment, it should be no later than the fifth day beyond the pay day. Clearly, government is in the wrong with the ZamPost workers, the Kabwe Council workers and all other council workers not paid. Government is also in the wrong with the Zambia contractors who haven’t been paid their dues years after doing the service,” he said. And Kalaba said the closure of the Copperbelt University was unfortunate, uncalled for and very costly to the country and it is affecting the standards and quality of education and the products of the education system. “A responsible leadership could have addressed the root cause of the problem. The superficial remedial measures of closing universities and issuing threats do not offer sustainable solutions. I urge the suffering workers to soldier on. I urge the students to take heart. Let’s continue to dialogue and to demand payment for the work done in peace and harmony,” he said. 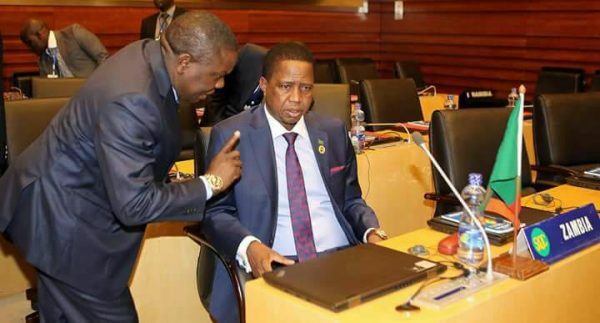 On Sunday President Edger Lungu challenged Kalaba to provide proof of corruption in the government and report the Anti-Corruption Commission. He said Kalaba should not use the issue of imaginary corruption to tarnish the image of the Party when everyone knows that he resigned from his position as Foreign Affairs Minister so that he could start pushing his Presidential ambitions. He stated that he had however, taken time to advise Kalaba that if he wanted to succeed him, he needed to wait for the right time and not to be in a rush. And President Lungu told the people of Bahati in Mansa district that their constituency would have developed way back had Kalaba put their needs ahead of his presidential ambitions. Speaking at a rally held at Kaole stadium in Senama, President Lungu said Bahati had suffered poor management at the hands of Kalaba because he was not a team player. “Kalaba was arrogant and pompous and refused to approach his colleague ministers to lobby for clinics, schools and roads among other things. Kalaba had no love for his constituents and had used his position as a lawmaker to further his personal agenda……”We had a wrong manager in place. Had he loved you, he would have approached the Minister of Infrastructure for roads and he would have been given. He would have approached the Health Minister for Hospitals and he would have been given. But because of being self-centered, pompous and arrogant, he failed to approach his friends,” he said.